Everything is SO exciting when you're one. I will never get sick of hearing him say, "Oh wow!" I'm learning very quickly that if I don't want something broken, I have to keep it out of reach. Destructo boy is fast and strong! Christmas tree ornaments = toys. But I can't blame him. Most of mine are inherited from my parents and are cars. We seriously need to work on volume control. How the heck do you teach a 1 year old what yelling is? Grocery carts are getting difficult. He wants to run. Problem is that he won't stay by me! He loves puzzles, building things, and cars. He gets shy around people he doesn't know and he tries so hard not to smile. His bashful face could kill me! He is all boy. 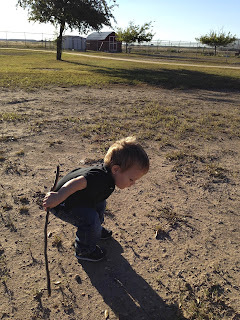 Sticks and dirt could keep him content for a lifetime. Another testament as to why toys are often unnecessary. Except for cars. Cars are necessary. I'm seriously amazed at how many things he understands. I can basically ask him to get anything (Milo, can you get your shoes? Milo, can you climb in your carseat?) and he knows! And he does it! I know it sounds really elementary, but it's a big change from him not being able to do or understand any of those things. I think sometimes we don't give kids enough credit for how sharp they are!